Cilantro Crusted Mahi Mahi | Let's Cook With Bry! Here’s a quick and easy recipe that’s delicious and versatile – use any mild white fish fillet, such as mahi mahi or tilapia. Preheat oven (or toaster oven) to 375 degrees. Heat olive oil in a large oven proof skillet over medium high heat. Season both sides of fish with salt and pepper. Dredge one side only of each fillet in the cilantro. 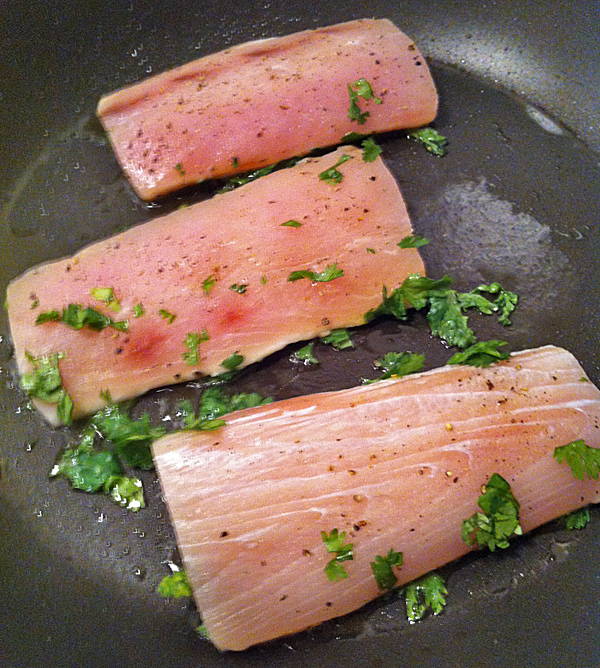 Place the fish, cilantro side down, into the hot olive oil, being careful not to crowd the pan. Cook until cilantro is crisp, checking often not to burn. Turn fish fillets over, then place in preheated oven. Bake for 3-5 minutes, or until fish flakes easily with a fork. If you do not have a large oven proof skillet or would prefer to use your toaster oven, you can cook fish a couple of fillets at a time, then transfer to a preheated baking dish to finish the cooking. 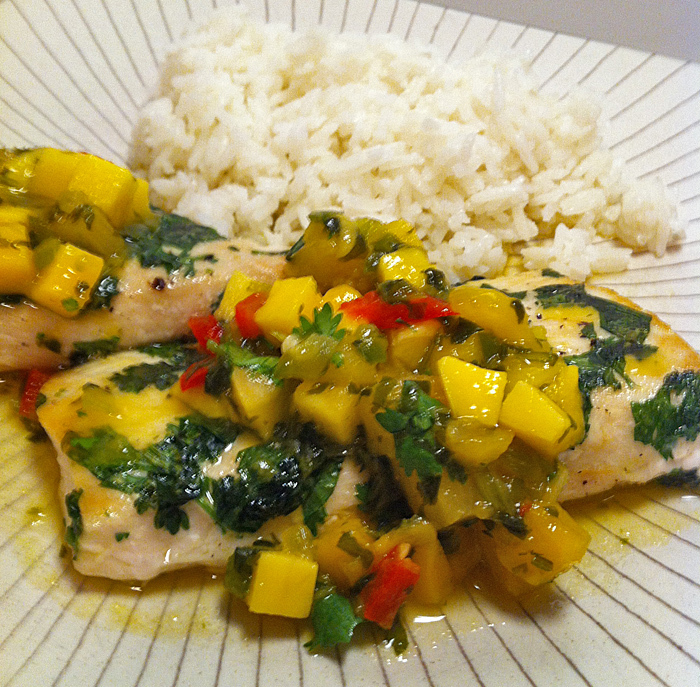 This is great accompanied by a few generous tablespoons of a tropical mango salsa serve atop the fish, and white jasmine rice cooked with coconut milk instead of water. 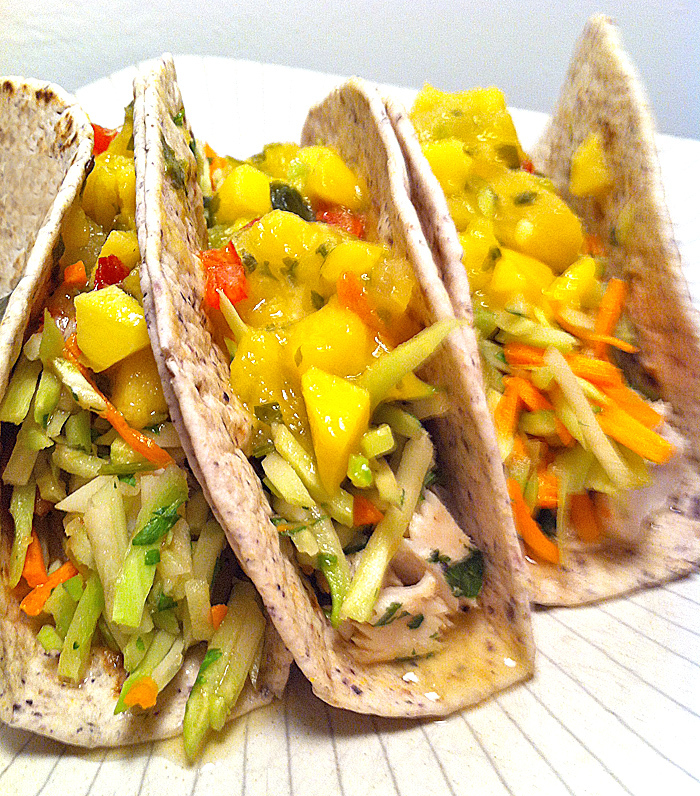 Also great as fish tacos, with a mango salsa and a broccoli/carrot slaw tossed in fresh lime juice.